When the summertime hits, it’s easy for kids to fill their days slouching on the couch, playing video games. When children are sedentary for days at a time, it can lead to unhealthy weight gain. The Centers for Disease Control and Prevention suggests the easiest way for kids to ward off extra pounds is to get at least 60 minutes of physical activity each day. So instead of watching your kids sit around this summer, think of ways to get active with them. Sign up for family-friendly fitness classes. During the summer, you can get active with your kids by working out together like our Family Yoga Class. The instructors who teach these classes choose fun exercises that can be easily modified to challenge both children and adults and will make sure to make the class fun and engaging for kids. If you have a pool in your yard, or live near a facility that has a public pool or gym pool, schedule regular swim days with your kids. Not only will this activity help them beat the summer heat, it will also give them a great cardio workout. In addition, the resistance of the water can increase muscle mass by working the body’s large muscle groups. If your kids need to improve their swimming skills, consider signing them up for Swim Lessons, perfect for all age levels. Your kids may not admit it, but they will love it when you challenge them to a game of basketball or freeze tag. Games such as these can help your family work up a sweat and increase muscle and bone mass in their lower extremities. Think back to the things you did as a kid, like Hopscotch, Red Light, Green Light, Simon Says, Hot Potato, or Leapfrog. Your kids will love playing these games with you and you’ll feel like a kid again when you let loose and have fun as a family. Build an obstacle course.Gather old tires, hula hoops, cans and any other items you can use to construct an obstacle course. The course can be as easy or as challenging as you’d like. The tougher the course, the more effort your kids will have to put into it, and the more calories they will burn. Once the course is built, challenge your children to finish it faster than you. Click here for more ideas on how to build an obstacle course. Start training for a Fun Run. Many 5ks and 10ks are designed for all fitness levels and many allow kids and strollers to participate. Sign up for a family friendly race event and start training together for your big day. Rotate through having each member pick the workout-of-the-day so everyone feels like they have a san the fun. If you need help narrowing down the list of workouts, write exercises like “10 jumping jacks”, “5 squats” or “ride bikes for 20 minutes” on popsicle sticks, put them all in a jar and draw a couple of stick every day. This will always keep the training feeling fresh and different. For ideas and information on upcoming races in the greater Sacramento Area, view our Cal Fit Active events page for 2014. 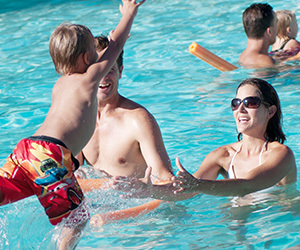 There are tons of summertime activities you can do to get active with your kids. Swimming, playing outdoor games, doing obstacle courses and attending family-friendly fitness classes are just a few suggestions. If you opt for outdoor activities, encourage your children to drink plenty of water to help them stay hydrated.